Let’s start with the geopolitical Big Bang you know nothing about, the one that occurred just two weeks ago. Here are its results: from now on, any possible future attack on Iran threatened by the Pentagon (in conjunction with NATO) would essentially be an assault on the planning of an interlocking set of organizations -- the BRICS nations (Brazil, Russia, India, China, and South Africa), the SCO (Shanghai Cooperation Organization), the EEU (Eurasian Economic Union), the AIIB (the new Chinese-founded Asian Infrastructure Investment Bank), and the NDB (the BRICS' New Development Bank) -- whose acronyms you’re unlikely to recognize either. Still, they represent an emerging new order in Eurasia. Tehran, Beijing, Moscow, Islamabad, and New Delhi have been actively establishing interlocking security guarantees. They have been simultaneously calling the Atlanticist bluff when it comes to the endless drumbeat of attention given to the flimsy meme of Iran’s "nuclear weapons program." And a few days before the Vienna nuclear negotiations finally culminated in an agreement, all of this came together at a twin BRICS/SCO summit in Ufa, Russia -- a place you’ve undoubtedly never heard of and a meeting that got next to no attention in the U.S. And yet sooner or later, these developments will ensure that the War Party in Washington and assorted neocons (as well as neoliberalcons) already breathing hard over the Iran deal will sweat bullets as their narratives about how the world works crumble. Here are just a few examples of the dizzying activity that took place at Ufa, all of it ignored by the American mainstream media. 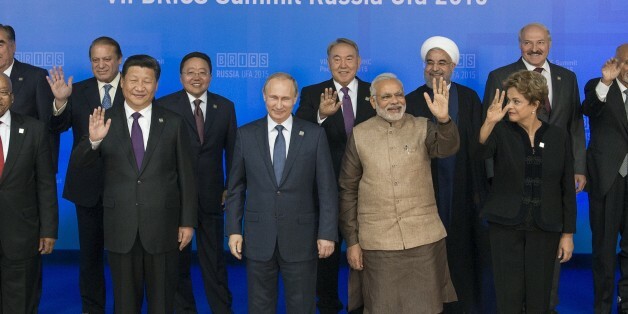 In their meetings, President Putin, China's President Xi Jinping, and Indian Prime Minister Narendra Modi worked in a practical way to advance what is essentially a Chinese vision of a future Eurasia knit together by a series of interlocking “new Silk Roads.” Modi approved more Chinese investment in his country, while Xi and Modi together pledged to work to solve the joint border issues that have dogged their countries and, in at least one case, led to war. The NDB, the BRICS’ response to the World Bank, was officially launched with $50 billion in start-up capital. Focused on funding major infrastructure projects in the BRICS nations, it is capable of accumulating as much as $400 billion in capital, according to its president, Kundapur Vaman Kamath. Later, it plans to focus on funding such ventures in other developing nations across the Global South -- all in their own currencies, which means bypassing the U.S. dollar. Given its membership, the NDB’s money will clearly be closely linked to the new Silk Roads. As Brazilian Development Bank President Luciano Coutinho stressed, in the near future it may also assist European non-EU member states like Serbia and Macedonia. Think of this as the NDB’s attempt to break a Brussels monopoly on Greater Europe. Kamath even advanced the possibility of someday aiding in the reconstruction of Syria. On the ground level, this should be thought of as part of the New Great Game in Eurasia. Its flip side is the Trans-Pacific Partnership in the Pacific and the Atlantic version of the same, the Transatlantic Trade and Investment Partnership, both of which Washington is trying to advance to maintain U.S. global economic dominance. The question these conflicting plans raise is how to integrate trade and commerce across that vast region. From the Chinese and Russian perspectives, Eurasia is to be integrated via a complex network of superhighways, high-speed rail lines, ports, airports, pipelines, and fiber optic cables. By land, sea, and air, the resulting New Silk Roads are meant to create an economic version of the Pentagon’s doctrine of “Full Spectrum Dominance” -- a vision that already has Chinese corporate executives crisscrossing Eurasia sealing infrastructure deals. For Beijing -- back to a 7% growth rate in the second quarter of 2015 despite a recent near-panic on the country’s stock markets -- it makes perfect economic sense: as labor costs rise, production will be relocated from the country’s Eastern seaboard to its cheaper Western reaches, while the natural outlets for the production of just about everything will be those parallel and interlocking “belts” of the new Silk Roads. Meanwhile, Russia is pushing to modernize and diversify its energy-exploitation-dependent economy. Among other things, its leaders hope that the mix of those developing Silk Roads and the tying together of the Eurasian Economic Union -- Russia, Armenia, Belarus, Kazakhstan, and Kyrgyzstan -- will translate into myriad transportation and construction projects for which the country’s industrial and engineering know-how will prove crucial. And don’t forget Iran. In early 2016, once economic sanctions are fully lifted, it is expected to join the SCO, turning it into a G9. As its foreign minister, Javad Zarif, made clear recently to Russia's Channel 1 television, Tehran considers the two countries strategic partners. "Russia,” he said, “has been the most important participant in Iran's nuclear program and it will continue under the current agreement to be Iran's major nuclear partner." The same will, he added, be true when it comes to “oil and gas cooperation,” given the shared interest of those two energy-rich nations in “maintaining stability in global market prices." Thanks to a set of cross-pollinating political institutions, investment funds, development banks, financial systems, and infrastructure projects that, to date, remain largely under Washington’s radar, a free-trade Eurasian heartland is being born. It will someday link China and Russia to Europe, Southwest Asia, and even Africa. It promises to be an astounding development. Keep your eyes, if you can, on the accumulating facts on the ground, even if they are rarely covered in the American media. They represent the New Great -- emphasis on that word -- Game in Eurasia. Tehran is now deeply invested in strengthening its connections to this new Eurasia and the man to watch on this score is Ali Akbar Velayati. He is the head of Iran's Center for Strategic Research and senior foreign policy adviser to Supreme Leader Ayatollah Khamenei. Velayati stresses that security in Asia, the Middle East, North Africa, Central Asia, and the Caucasus hinges on the further enhancement of a Beijing-Moscow-Tehran triple entente. As he knows, geo-strategically Iran is all about location, location, location. That country offers the best access to open seas in the region apart from Russia and is the only obvious east-west/north-south crossroads for trade from the Central Asian “stans.” Little wonder then that Iran will soon be an SCO member, even as its “partnership” with Russia is certain to evolve. Its energy resources are already crucial to and considered a matter of national security for China and, in the thinking of that country’s leadership, Iran also fulfills a key role as a hub in those Silk Roads they are planning. That growing web of literal roads, rail lines, and energy pipelines, as TomDispatch has previously reported, represents Beijing’s response to the Obama administration’s announced “pivot to Asia” and the U.S. Navy’s urge to meddle in the South China Sea. Beijing is choosing to project power via a vast set of infrastructure projects, especially high-speed rail lines that will reach from its eastern seaboard deep into Eurasia. In this fashion, the Chinese-built railway from Urumqi in Xinjiang Province to Almaty in Kazakhstan will undoubtedly someday be extended to Iran and traverse that country on its way to the Persian Gulf. At the St. Petersburg International Economic Forum last month, Vladimir Putin told PBS's Charlie Rose that Moscow and Beijing had always wanted a genuine partnership with the United States, but were spurned by Washington. Hats off, then, to the “leadership” of the Obama administration. Somehow, it has managed to bring together two former geopolitical rivals, while solidifying their pan-Eurasian grand strategy. Even the recent deal with Iran in Vienna is unlikely -- especially given the war hawks in Congress -- to truly end Washington’s 36-year-long Great Wall of Mistrust with Iran. Instead, the odds are that Iran, freed from sanctions, will indeed be absorbed into the Sino-Russian project to integrate Eurasia, which leads us to the spectacle of Washington’s warriors, unable to act effectively, yet screaming like banshees. NATO's supreme commander Dr. Strangelove, sorry, American General Philip Breedlove, insists that the West must create a rapid-reaction force -- online -- to counteract Russia's "false narratives.” Secretary of Defense Ashton Carter claims to be seriously considering unilaterally redeploying nuclear-capable missiles in Europe. The nominee to head the Joint Chiefs of Staff, Marine Commandant Joseph Dunford, recently directly labeled Russia America’s true “existential threat”; Air Force General Paul Selva, nominated to be the new vice chairman of the Joint Chiefs, seconded that assessment, using the same phrase and putting Russia, China and Iran, in that order, as more threatening than the Islamic State (ISIS). In the meantime, Republican presidential candidates and a bevy of congressional war hawks simply shout and fume when it comes to both the Iranian deal and the Russians. In response to the Ukrainian situation and the “threat” of a resurgent Russia (behind which stands a resurgent China), a Washington-centric militarization of Europe is proceeding apace. NATO is now reportedly obsessed with what’s being called “strategy rethink” -- as in drawing up detailed futuristic war scenarios on European soil. As economist Michael Hudson has pointed out, even financial politics are becoming militarized and linked to NATO’s new Cold War 2.0. In its latest National Military Strategy, the Pentagon suggests that the risk of an American war with another nation (as opposed to terror outfits), while low, is “growing” and identifies four nations as “threats”: North Korea, a case apart, and predictably the three nations that form the new Eurasian core: Russia, China, and Iran. They are depicted in the document as “revisionist states,” openly defying what the Pentagon identifies as “international security and stability”; that is, the distinctly un-level playing field created by globalized, exclusionary, turbo-charged casino capitalism and Washington's brand of militarism. So consider it the Mother of All Blockbusters to watch how the Pentagon and the war hawks in Congress will react to the post-Vienna and -- though it was barely noticed in Washington -- the post-Ufa environment, especially under a new White House tenant in 2017. In the end, whatever Washington may do, it will certainly reflect a fear of the increasing strategic depth Russia and China are developing economically, a reality now becoming visible across Eurasia. At Ufa, Putin told Xi on the record: "Combining efforts, no doubt we [Russia and China] will overcome all the problems before us." Pepe Escobar is the roving correspondent for Asia Times, an analyst for RT and Sputnik, and a TomDispatch regular. His latest book is Empire of Chaos. Follow him on Facebook by clicking here.